Easy drive on July 29, 2016 took us to North Utica. We hit a little rain but not much. The only frustrating thing was our stop for gas. The guy at the first pump, pumped his gas then went inside McDonald's for lunch without moving his car. We were third in line waiting, the two cars in front of us moved to other pumps, but with the RV we couldn't. He didn't come back out for all most 15 minutes! If you are going inside after pumping your gas, be considerate and move to a parking spot. We stayed at the Hickory Hollow Campground. 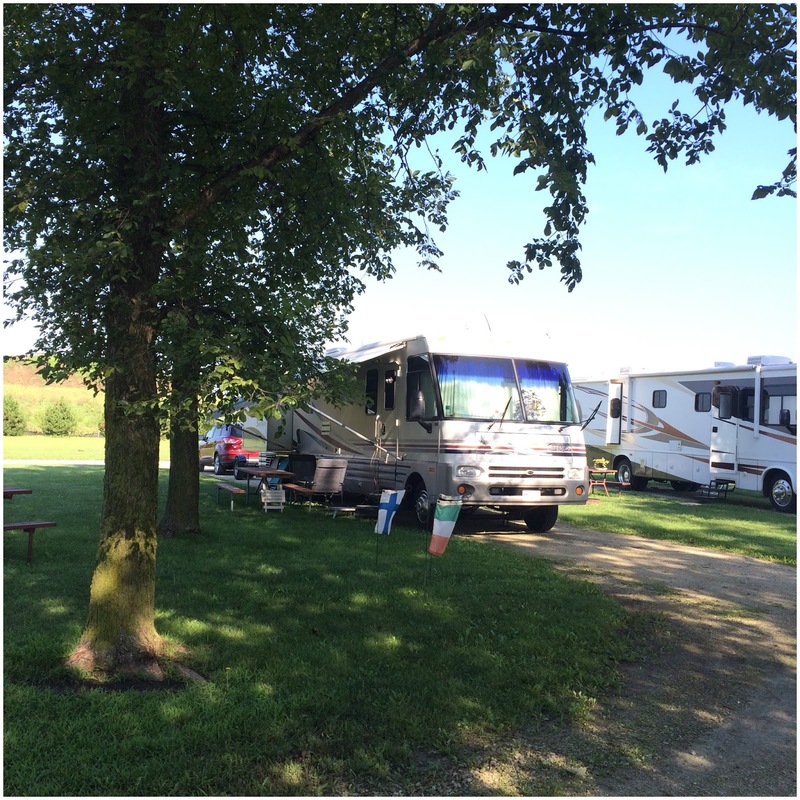 It is right off of I-80, depending on where you are in the campground the road noise could be an issue. We were in the very back and it wasn't bad at all, up in the front it is louder. The sites are about average width, gravel but level. There is a picnic table and a fire pit. 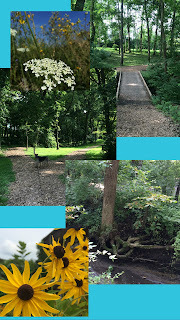 The campground is very well maintained with lots of open spaces for dog walking and some nice paths through the woods. 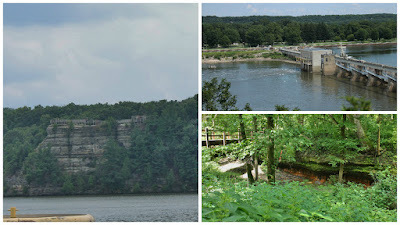 It is surrounded by farm land, and next to a rock quarry that does blasting every now and then and it rocked the RV. They don't tell you this when you check in so it was a bit of a surprise. WiFi was good and Verizon signal was strong. We paid $30.60 a night with discounts from both Good Sam and Passport. The reason we picked this area is that there are three Peter "Wolf" Toth Indians here. The first up was in Ottawa. 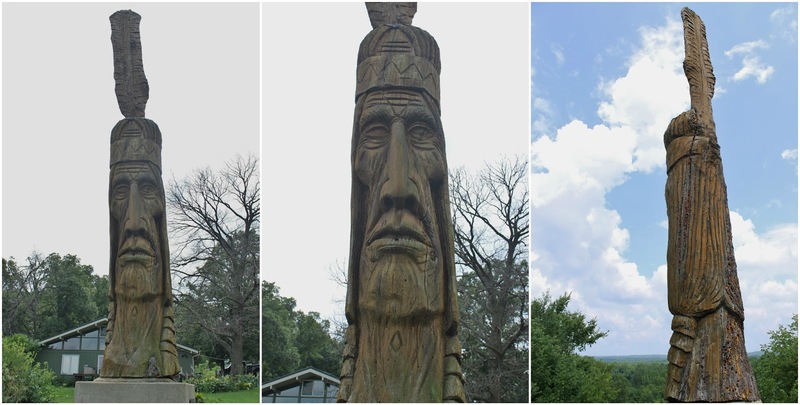 He sits in Allen Park, right on the Illinois River, it is the 61st carving on the Trail of the Whispering Giants. It stands 13-feet high and was carved in 1989. The name is "Ho-Ma-Sjah-Nah-Zhee-Ga". The second one is in Hopewell, it sits at the entrance to Hopewell Village which is really just a subdivision. This is the 16th one carved, it was done in 1975 out of Burr Oak and stands 18-feet tall. He is titled Hopewell Giant. The last one is in the Starved Rock State Park in front of the lodge. It is the 62nd carving and stands only 12-feet tall. 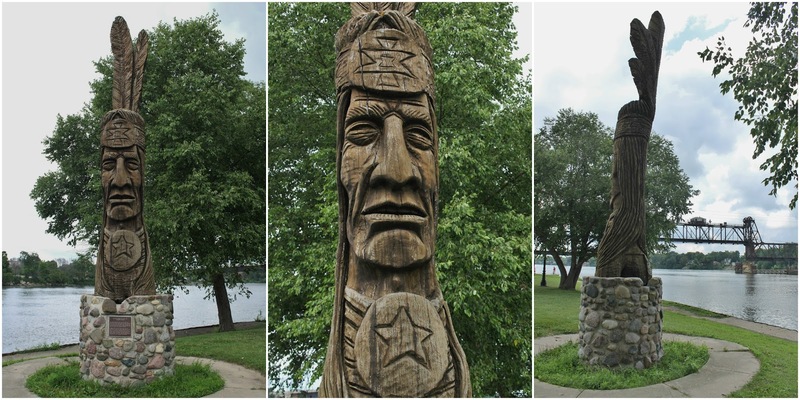 It was carved in 1990 and is called "Chief Walks With the Wind". In our travels to get the Indian pictures we came across a few Roadside Oddities. 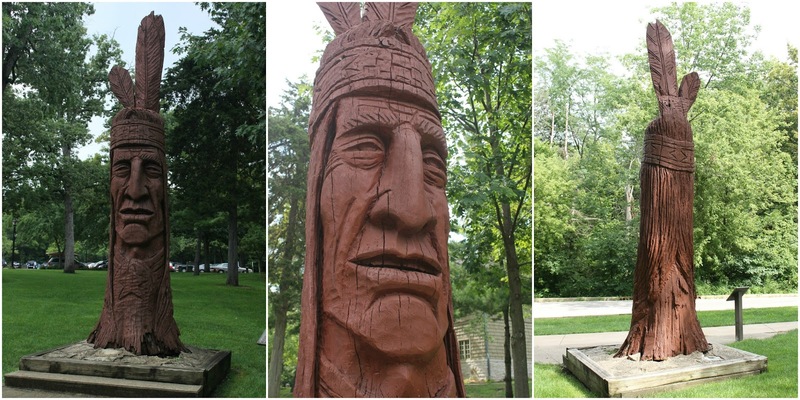 In Allen Park, where we found the Indian carving there are two very large metal sculptures. 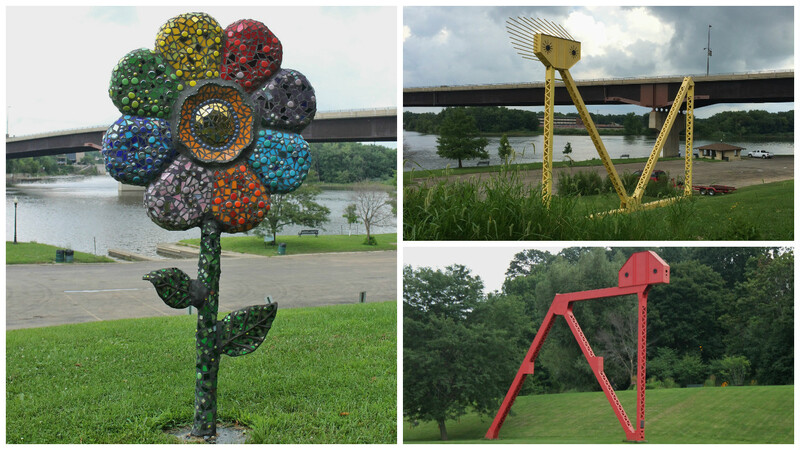 Artist, Mary Fanning created the sculptures in 1982 from sections of the Hilliard Bridge that was replaced with the current bridge over the Illinois River. The red one is titled "Bending", it is standing and bending over to the side to touch the ground. The yellow one is titled "Reclining" and is lying on its back while propped up on its elbows. The flower was very cool but had no sign to identify the artist. "Rootbeer Man" lives in Oglesby, the Lincoln-Douglas debate monument is in downtown Ottawa, and Peru is home to the Star Trek Hand. 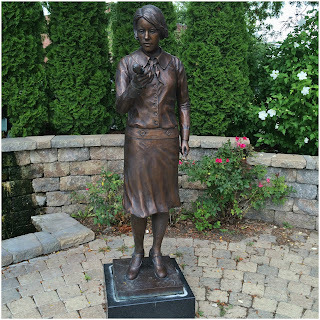 Also in Ottawa, we found "Radium Girl", it is a monument to the woman who worked for the Radium Dial Company. They painted the glow-in-the-dark dials for clocks and later for WWII aircraft. They had a practice of wetting the paint brushes with their lips to keep a fine point on the brush. Once the women started getting sick, suffering from cancer, honey-comb bones and other fatal diseases the company hired doctors who told the woman that the material was safe and it would help to make "their cheeks pink". In the early 1940's a group of 14 women who called themselves "The Society of the Living Dead" sued the Radium Dial Company. After numerous appeals, the women eventually won meager settlements, some died before the case was ended. 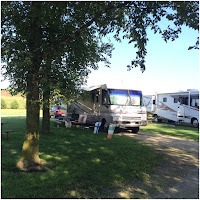 We were camped just off of the Michigan/Illinois Canal. The 96-mile canal originally connected the Great Lakes to the Mississippi River. 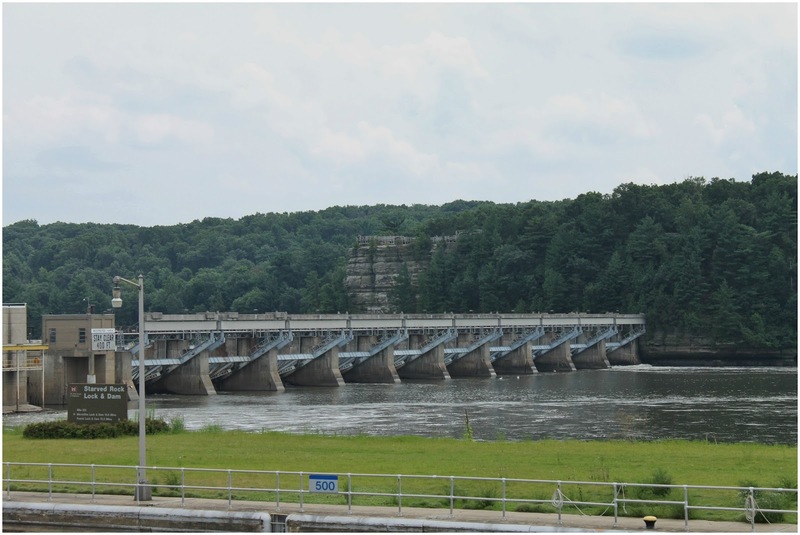 It was opened in 1848 and was used until 1933 when the Illinois Waterway was completed. 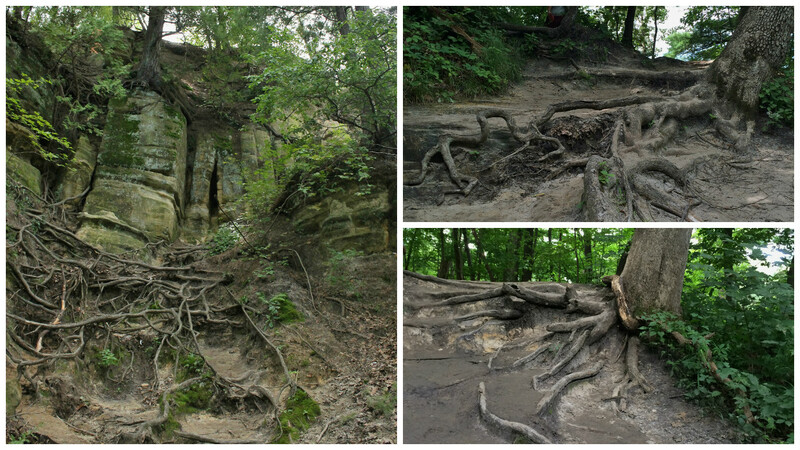 Today sections of the canal have been closed, but along the 96-miles you will find state parks, restored historical sites and a diverse landscape of bluffs and rolling hills. In LaSalle there is a Visitor Center which also is a cafe, and where you can take a mule driven boat ride. 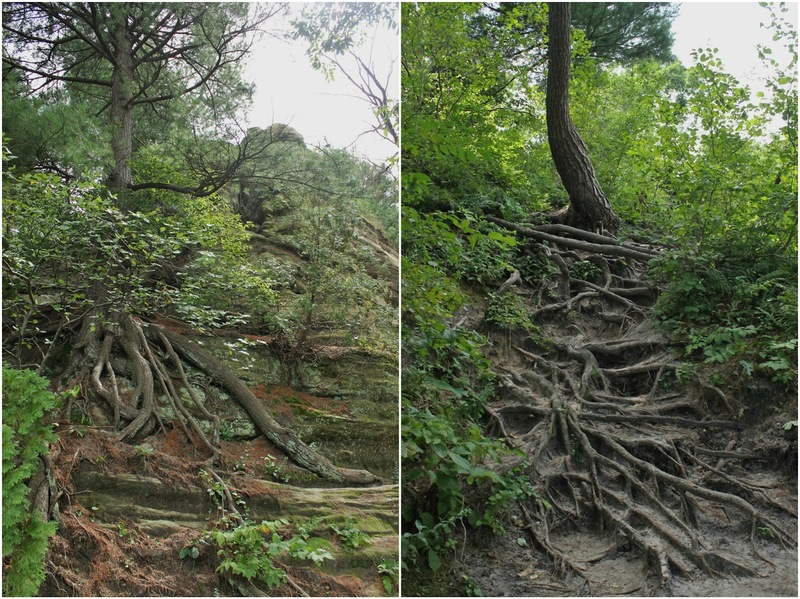 A 61.5-mile trail follows the old towpath, where you can hike or bike. Over the years a number of towns grew along the canal, today most of them have historic buildings and artifacts. 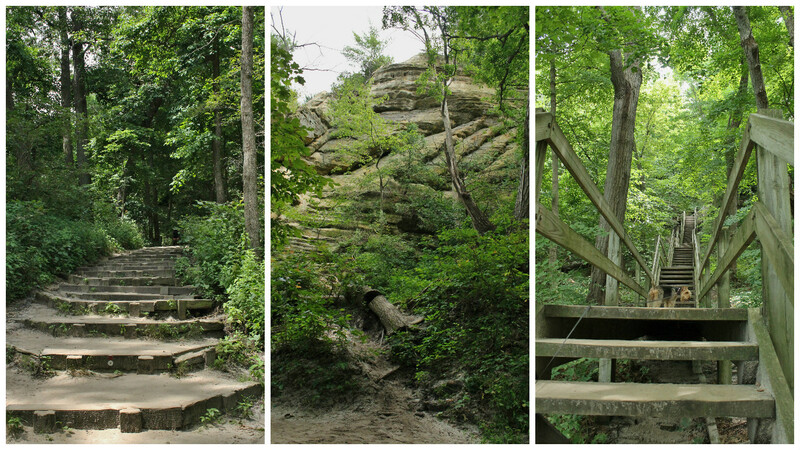 Starved Rock State Park is not only the home of the Peter "Wolf" Toth Indian, it has hiking trails that take you through a number of canyons as well as along the Illinois River. According to local legend, a group of Native Americans of the Illinois Confederation (also called Illiniwek) were pursued by the Ottawa Indians and they fled to the butte. The Ottawa continued their siege and the Illiniwek starved, hence the name. 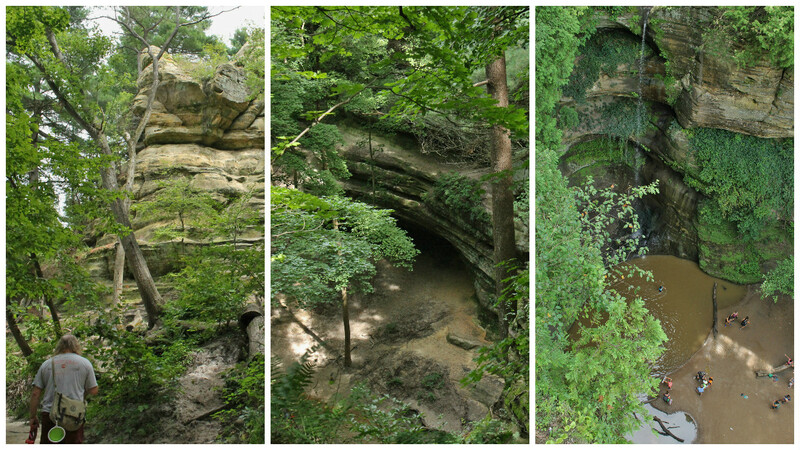 We hiked through the Wildcat Canyon, a little over 2-miles and the heat was a killer. We did get to see some beautiful sights, the rock formations were awesome. The view of the Starved Rock Lock and Dam was pretty nice too. The waterfalls were mostly dry but one had a little water running over it. There were signs everywhere telling you to not go in the water due to chemicals from the surrounding farms, but people were still swimming. 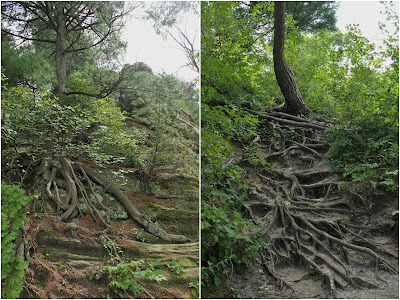 Of course there were lots and lots of stairs and some of the most amazing tree roots we have seen in a long time. Some interesting "graffiti". 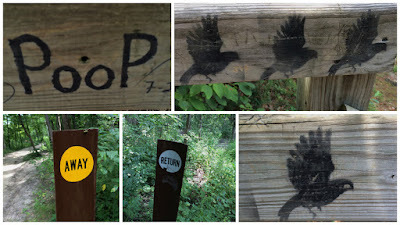 Lots of bird stencils and the word Poop. This reminded us of Nancy's nephew Don, who passed away last year, he had a favorite saying "Say Poop with me, it's fun, you get to pee twice". The away and return signs were helpful, so you knew if you were heading to or from the visitor center. 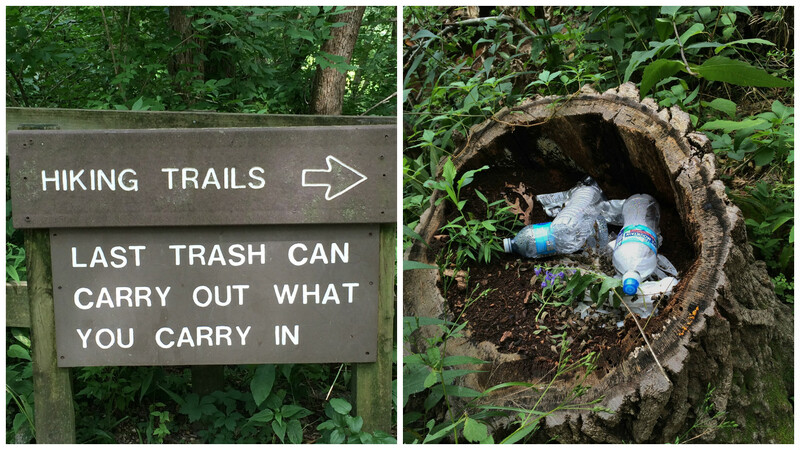 While the hike was beautiful we were disappointed in the trash that people had left behind. We stopped counting water bottles at 48, under one stairway was 15. We usually carry a plastic bag when we hike to pick up any trash, this time we didn't have one and it would never have held all of it. 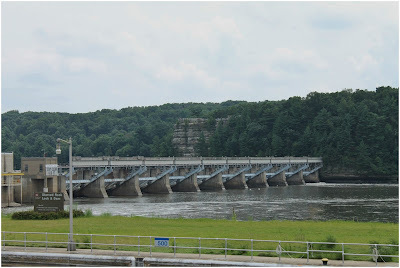 The Starved Rock Lock and Dam was very interesting. They have a 2nd floor observation deck so you can get a good view of the boats coming through. 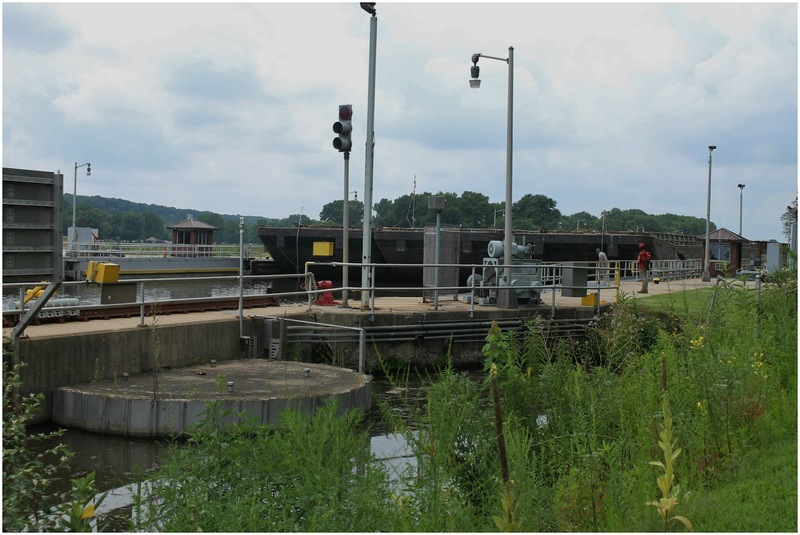 The tug boats are usually pushing up to 15-barges at a time and only nine will fit in the lock. They lift the barges, then pull them out with cables. 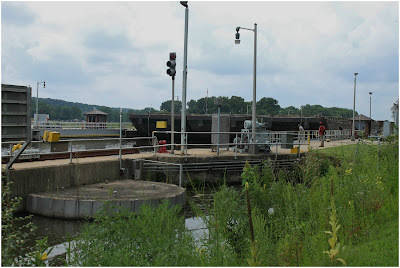 The water is lowered, and the tugboat comes back in, they lift it and then it pulls out and they reconnect and move to the next lock. We talked with one of the crew members while all of this was going on, he told us that there are 27 locks they go through, and they have to do this at each one. The crew works one month on the boat and one month off the boat. Next up, a one night stay in Elkhart, IN and then Michigan! We should have known better than to put the hydralic fluid bottle in the underneath storage without wrapping it up. When storing any type of fluid it is best to place the jars and bottles in a plastic tote or enclose them in a gallon zipbag. This will keep you from having to clean up a big mess. By the way cat litter works wonders to help soak up spills.